Add into a test tube a small spatula-tipful copper(II) sulfate and dissolve with approx. 1 ml distilled water. 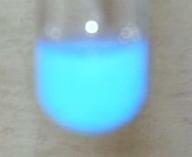 A clear, slighty light blue solution develops. Add dropwise ammonia solution 3.5%. 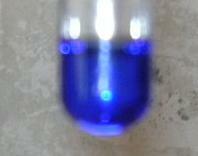 A voluminous, tough blue deposit is precipitated, which with further additions of ammonia is again dissolved, forming a clear, dark blue solution. The diluted solution can be discharged into the drainage. Copper(II) precipitates like many metallic cations in an alkaline milieu as a hydroxide. With a surplus of ammonia the soluble copper(II) tetraammine complex is formed - [Cu(NH3)4]2+.